I’m getting a bit nifty with my quotes now aren’t I. I figured it was probably about time I started taking/making my own images for my quote’s of the week. I don’t want to be breaking any copyright rules now do I..! I chose this quote for a number of reasons. 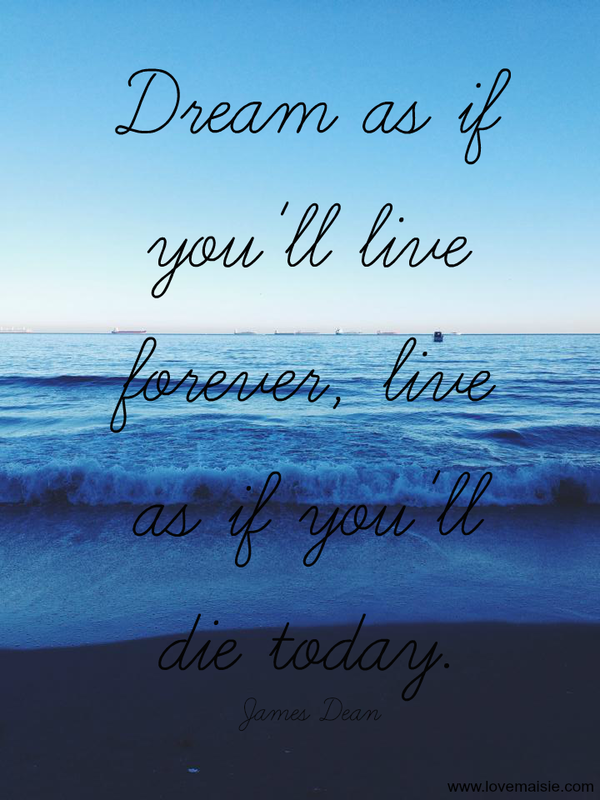 Firstly, “dream as if you’ll live forever,” if you remember back in January I wrote a post about following my dreams and step by step i’m actually doing some of them! I’m working on and planning a number of projects at the moment, one of them being a launch for my jewellery, you can check out the site so far right here. Other’s i’m not ready to talk about just yet but don’t worry, all in good time! I’m trying not to let little things hold me back from doing things that I want to do and achieving things that I want to achieve. “live as if you’ll die today,” because what’s to say that you wont die today? Sorry to play the morbid card but it’s true. I mean, I don’t know what happens when we die(if I did i’d be making a lot more money than I do now) but what if you do have some time reflect back on your life before you “pass on“? All the things you didn’t do, all the places you never visited? This brings me to another mini announcement and that is vlogging, weekly vlogging to be precise. I’ll be uploading a weekly vlog once a week, every week for the remainder of the year, so make sure that you’re subscribed to my YouTube channel so that you don’t miss them! Think of it as a little challenge with myself to do something consistently, every single day(taking footage that is) and then share it with the world, because why not? I also think it’ll make me more conscious to do more with my time and be more active! So if there’s something out there that you’ve been wanting to do for a while now, maybe even something that only crossed your mind yesterday, get out there and do it! What’s stopping you? I hope you have a wonderful day and that this post has left you somewhat inspired to go out into the world today and show ‘um what you’ve got! Great quote 🙂 It's one I actually need to start putting into action!